Aditi Mangaldas Dance Company - The Drishtikon Dance Foundation presented Drishtikon Home-Studio Baithak: Season IV featuring tabla recital by Nishit Gangani, Contemporary solo by Manoj Sonagra and Kathak solo by Anjana Singh on 11th August at Drishtikon Dance Studio, Delhi. Manoj Sonagra is not a single step behind the vision that Drishtikon Dance Foundation is blessing its dancers with. The excellent repertoire, the mentoring within the group of senior and junior Kathak dancers, the ambience and the discipline within the parameters of a dance troupe is all so finely displayed that for once, one doesn’t feel out of frame. Manoj’s boundaries within a circle of life is displayed in the staccato movements of body and mind. His steps were interspersed by steps of ups and downs that life delves into with musical interludes by Lisa Gerrard and Faraz Ahmad in live accompaniment. 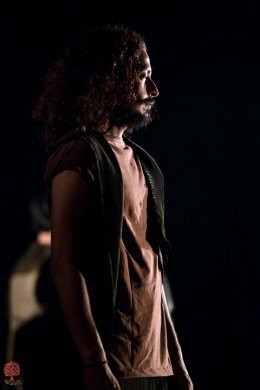 The intimacy of audience and performer is starkly so up-close that one is seen participating in the process of creativity and feels like dancing and being one with the performer. The humble effort by the dance group to promote saw the accentuated Kathak recital with an excellent footwork solo by Anjana Singh. 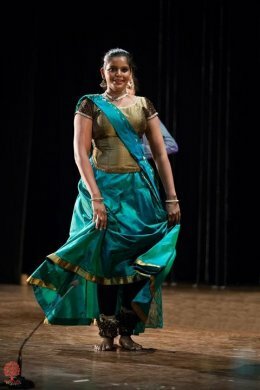 A dusky demure dancer off stage transforms into a sublime ethereal rain goddess in a melee of intricate footsteps on Ardha Chandra tala and teen tala. She also experimented on a nine and half beat tala. Music apart, the rains outside and the rains within also starkly juxtaposed each other. Youngster Nishit Gangani was the find of the evening with excellent and brilliant mastery over tabla kaidas inculcated from his gurus. He also played the kaidas from known names in tabla field like Ustad Zakir Hussain and his guru Kundan Lal Gangani. His age and practice showed the ardour of young blood that is toiling behind the cameras and stage to master the art. The Aditi Mangaldas stamp was vividly displayed in the arrangement and neatness of the artistic presentation. A big applause to Gauri Diwakar, the senior most team member, in binding the space and time in equilibrium.